Isolated leaders are the dumbest people in the building. A nameplate on the door and a title after your name doesn’t make you smarter than people with dirt under their fingernails. Disconnected leaders – seduced by position and perks – don’t get it. At lunch this week, a turnaround specialist explained that the answers for struggling organizations are typically found in front-line supervisors. This is especially true when internal issues are the reason for the struggle. 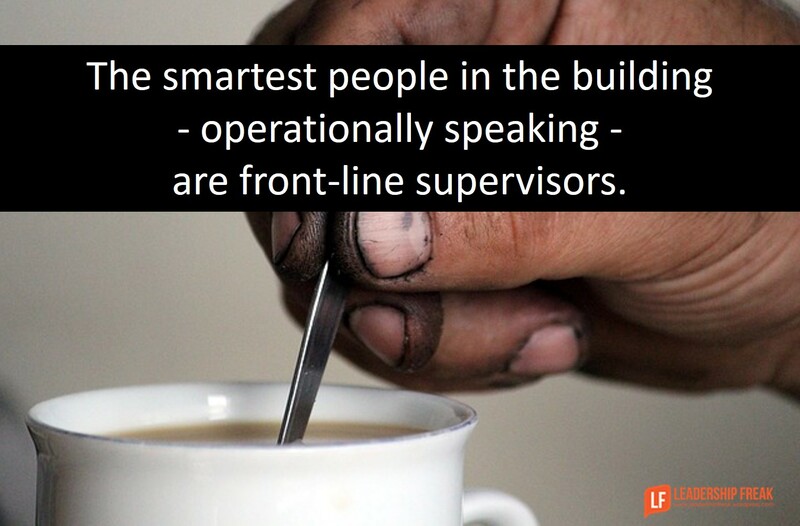 Front-line supervisors always understand day-to-day operations better than disconnected leaders. Don’t occasionally bring front-line supervisors to upper-management meetings. Do push information and authority to people who supervise work. Don’t plug your ears to nagging complaints from someone in a blue shirt. Don’t rush to solutions or give quick answers. Do lean in and ask questions. Why are we doing it that way? What’s holding you back from moving this forward? What assumptions got us into this mess? What’s important about this? For greater clarity, add, ‘for you,’ ‘for your team,’ ‘for our customers,’ or ‘for our organization,’ at the end of the question. Do make their lives easier. Clear the path. Remove obstacles to performance. If you’re in top management or the C-Suite, the people with sweat on their brows know more about day-to-day operations than you. How might organizations tap into the wisdom of front-line supervisors? All too often managers presume they know more than non-managers. Thanks Bob. It’s unfortunate that titles seem to shrink people’s brains. I think part of the issue is a closed mind. Nothing closes a mind quicker than arrogance. You must have got your play book from C.R. Smith at American. Sounds like something I should know about. Number 7 is very important. In employee reviews, I always have asked them what is the one thing I can do to make your life easier. There have been requests as simple as some additional lighting in an area of the office etc.. Things I would not have noticed. Spot on post. I want to give recognition to Maureen Beal, CEO of National Van Lines, as a leader who knows the value of staying in touch with her team at all levels. She is a head, heart and hands leader. Smart leaders know that staying connected to front-line employees means a better work culture and a better bottom line. Thanks Mim. It’s great to read about a connected leader. Yes! Often this problem is exacerbated when management is brought in from “outside,” perhaps even from other industries, and not only lack a connection to those they lead but perhaps even to the work itself. Such managers face multiple obstacles in building necessary relationships to the work and the workers. Frontline supervision is “where it’s at” in most organizations, because if they aren’t facilitating high performance, then it likely won’t exist. In many cases they are also the repository of institutional memory and keys to understanding the organization’s culture. It’s so obvious when you read it. But, unfortunately, this isn’t appreciated by leaders. ‘Don’t occasionally bring front-line supervisors to upper-management meetings.’- curious about your thinking here. Thanks for asking, Eric. The operative word is “occasionally.” It’s too unnatural and awkward if the contact between upper management and front-line supervisors is occasional. Plus, front-line supervisors already have their hands full. I think pushing authority down and being out on the floor regularly is a better alternative to having front-line supervisors attend upper management meetings. Because upper management deals with more issues than operations, it may be better for them to go to front-line supervisors, rather than have supervisors attend another meeting. I’ll add that if relationships are strong, it’s not a big deal for front-line supervisors to attend upper management meetings when applicable. Just a few thoughts. I’m glad you asked. All of these make sense, except #1: Don’t occasionally bring front-line supervisors to upper-management meetings. Why is that? It is the only non-obvious one to me. I have been in upper management, but am currently a front-line supervisor, and I don’t understand the problem with it. Bring ’em in often! Not occasionally. Thanks Mark. You asked the same thing as Eric. Please read above. Leaders who are disconnected from the front line and others doing the work is also a problem because of what General Stanley McChrystal in his TED talk (see https://www.ted.com/talks/stanley_mcchrystal?language=en) called “inversion of expertise.” Because of the fast pace of technological advances, which won’t slow down any time soon, incoming employees do know more than leaders. Leaders also need to stay engaged to be able to leverage this valuable knowledge that they hire into the organization. It took a while for me to view the video. The linked video didn’t run. I ended up going to youtube. Loved it. Thanks for extending the conversation. Thanks Brian. Unfortunately your story reflects a reality we all wish didn’t exist. In the end, I think this is about humility. So many leadership problems are solved by humility. In this case, lack of humility prolongs ignorance. If you can’t accept being wrong, you can’t learn to be right. Preach it Dan! As a turnaround/change consultant. This is spot on with how I address my engagements. True change comes from “the middle”. Aircraft carriers do turn – but it isn’t because someone at the top moved the wheel. It’s because the gears and processes inside the ship made a small device at the back of the ship move. A smart manager acknowledges how smart the people that delivers the mail and clean the office when the day is done. Also, cleaners and receptionists are incredibly important in terms of having an awareness of internal and external attitudes respectfully.